Terri Bibby, a SAORI weaving instructor from Salt Spring Island was the guest speaker at the Deep Cove Weavers & Spinners Guild meeting last Tuesday. The tables were filled with books, equipment and a colourful array of clothing. Terri explained that SAORI is a contemporary hand weaving program founded by a Japanese lady, Misao Jo about 40 years ago. SAORI weaving was originally developed to be accessible to anyone, but especially those with disabilities. 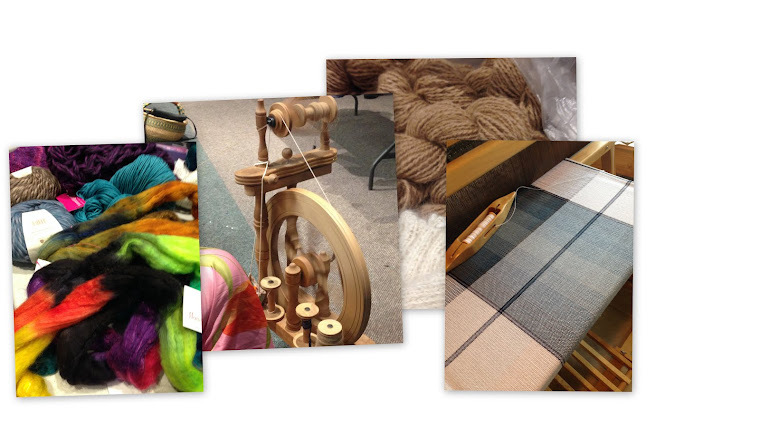 Now weavers of all kinds use the methods and tools to enhance their own weaving experience. In SAORI the weavers try to follow 4 slogans, because to free oneself from the conventional way of weaving is sometimes very challenging. 1) Consider the difference between a machine and a human being. 3) Let's look out through eyes that shine. Here are a few pictures from our "SAORI Day" at the Guild.